Heading north in the midday sun, Pan Am's NA-1 Crew brought the returning NH National Guard Military through Bow and into Concord where they would interchange with New England Southern. NEGS brought the loaded flat cars to their facilities for unloading in Canterbury. The train had 61 flat cars of assorted lengths and over 160 pieces of equipment. Power that day consisted of MEC 7655 (C40-8W) purple painted nose and all, and MEC 7541 (C40-8). While Pan Am acquired 24 C40-8's and 6 C40-8W's, these were the only appearances of the six-axle C's on "These NH Rails". 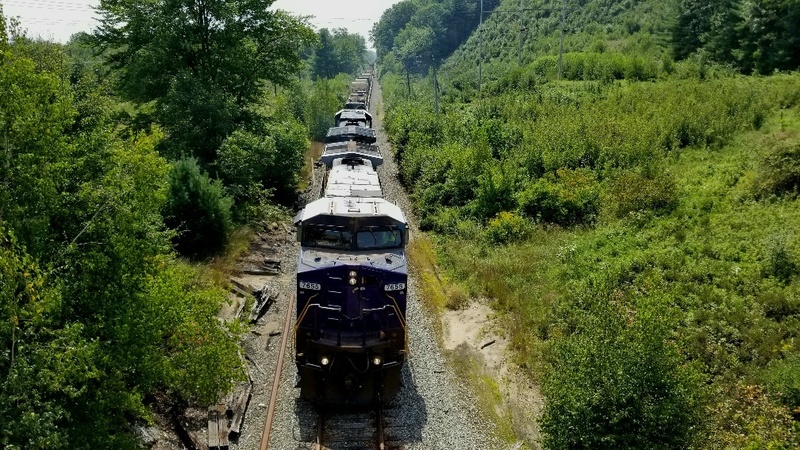 The GE's traveled all the way to Concord, where seeing anything with six axles is about as rare as it gets. <BR>By the looks of the closed windows on 7655, I bet the NA-1 Crew enjoyed some well deserved creature comforts like ice cold air conditioning on a hot summer's day. <BR>These engines would remain in Concord through the unloading process in Canterbury and would return south with the empty flat cars.